Using customer data and analytics is a key component in today’s online web stores. In order to improve ecommerce conversions and compete at the highest level possible for your business, you need to examine your customer data. This will allow you to offer relevant messages and personal experiences which can transform potential prospects into long term customers. Here’s a list of highly recommended and proven ways to get better conversions. Track Your Email Campaign Data: Effective marketing through email comprises of a few key metrics. The number of email visits, click through rate, conversions from email, and the unsubscribe rate. Adjust your emails to the behavior of your prospects, using A/B testing, and always keeping in mind that the key is to focus on problems that are directly affecting customers. The goal is to increase the value you offer a customer rather than decreasing costs. Observe Session Replays: Knowing how your visitors react, navigate, and where they get hung up on your site is valuable information. You can place important content strategically, as well as discover any usability problems that you may not have been aware of. Watching real user experiences gives you a complete overview of the best and worst parts of your site, and how to make personal and relevant content that will stick with visitors to your store. Past Behavior and Purchases/Customer Retention: One of the best ways to determine future behavior is by observing past activities. This will give you valuable insight into the brands, products, styles and tendencies or interests that your customers are interested in. Discounts are a great way to attract new customers, but can become a conditional requirement for repeat customers. Keep in mind that the value of your product is important too, so as not to over-extend on discounts to customers that already value your product. Targeted promotions are another way to extend discounts to existing customers without always offering them, and can help motivate repeat purchases. Timed Purchases: Valvoline offers oil ads timed according to your last oil change. This is an obvious way to make recurring sales. If you have a product that is essentially exhaustible, be sure to target former customers around the estimated (or a little before) time of consumption. Repeat revenue can (and should) also be included in service industries to bring back former clients. Products Viewed/Abandoned Cart Items: If someone views one of your products, especially several times, there is a clear interest. Should they still not decide to purchase it, send an email with a buyers guide to better inform the prospect. Also include any tools necessary to make a clear evaluation of your product. For determining the “Why” for abandoned carts, you need to examine a couple things. Is there a recurring theme? An obvious problem? What can you do to fix them and finish the conversion? In many cases, a simple email can do the trick. Whether there was a service issue that caused a disconnect, a phone call, or some sort of life distraction, sending abandoned cart emails can help to get customers back to complete their purchase. Determining the number of emails to send can be tested for the best results. Many companies only send one, but there is no hard proof that sending only one reminder is actually the best practice. Be sure the initial email (should you decide to have follow up reminders) identifies the product abandoned, and reminds them that it is in their cart. The next email depends on whether or not the initial email was opened. If if was not, send the initial reminder email a second time. If it was opened, move to the next stage of pushing them towards completing their purchase. Remember to include a sense of urgent response, such as a timed discount, or limited supply. As you can see, email is still an effective way to get results for your web store. 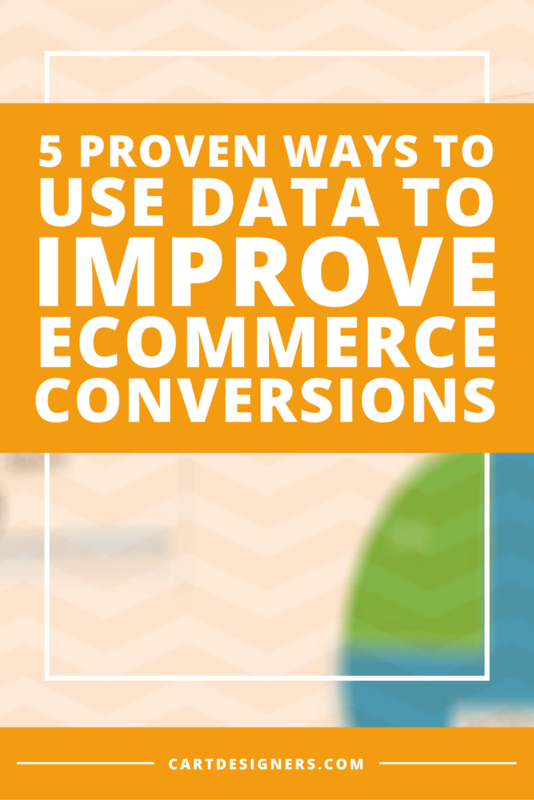 And it provides plenty of information that can help you to improve ecommerce conversions by the use of data. Incorporating this and other data into a growth driven design formula can give your online store the advantages it needs to become the authority in your product or service niche. If you’re uncertain about your current ecommerce platform, here’s 13 Reasons You Should be Moving to a Better Ecommerce Platform to help you take the next step.